Edmonton's Winnipeg's Cadence Weapon has been a staple on the burgeoning Canadian hip hop scene. He's reliably put out thought-provoking and entertaining music. On May 29th he returns with another dose in the form of a new full length album Hope In Dirt City. Horns feature prominently in a couple of arrangements, but in very different ways. On "Small Deaths" it's a smooth flow. On "Jukebox" it's as part of a hard-hitting scream-hop number. That really illustrates that there are two types of tracks on this record: the smooth, soulful ones, and the Saul Williams-style aggressive in-your-face assault. Tracks like "Cheval", and "No More Names (Aditi)" could easily be late night A.M. radio cuts. That can't be said for "Conditioning", on which Cadence Weapon slowly works himself into a frenzy. The title track is a passionate plea backed by a hard mechanical beat. The exception is "Hype Man". It starts as a spacey jam, with a hypnotizing arrangement. The click of the beat is so intoxicating that you'll be drawn back to it several times during the song, forgetting entirely that Cadence Weapon is rapping. The album standout is "Crash Course for the Ravers". Cadence Weapon reworks David Bowie's "Drive In Saturday" into an infectious fast-paced techno pop/hip hop hybrid. Overall, Hope In Dirt City is a quality record. Of course, by now we expect nothing less from Cadence Weapon. 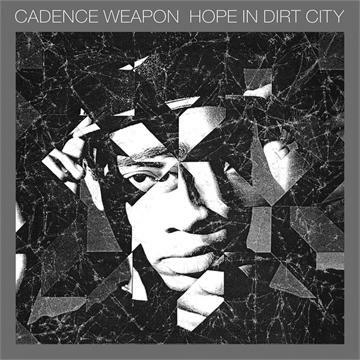 Cadence Weapon plays Lee's Palace in Toronto on June 23rd. Best tracks: "Crash Course for the Ravers", "Jukebox"
You lost me at Winnipeg.